Gunado - a cosy kiwi bach. Property 3: Gunado - a cosy kiwi bach. This property is located right on the beach. Property 5: This property is located right on the beach. The Library Bach - A special place people love! Property 6: The Library Bach - A special place people love! Te Hapu Chalet and Sleepout, cosy and romantic. 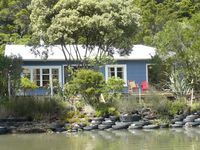 Property 19: Te Hapu Chalet and Sleepout, cosy and romantic. 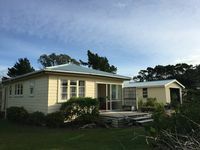 Property 24: Pakawau, Westhaven Hideaway. We had a wonderful and relaxing stay in the Patiki Cottage. The house was well equipped, warm and comfortable for all humans and canines. The fully fenced yard was a huge plus and the walk to the beach was very convenient. Excellent place to stay and we will book it again in the future ... especially during King fishing season. Thank you for providing a pet-friendly destination. The only thing that should be considered is to create awareness about Takaka hills. NZTA's neglect to not put up safety barriers where needed as well as irresponsible people of mature age, hooting and racing past cars on a unfamiliar Takaka hills is not a positive, turned out to be a local. This should be mentioned to assist people in planning their trip. Fantastic location, beauty and tranquility eventually to be had.